Discovery Adventure has a dedicated camera room. Relaxation area located on the upper deck offers a great view. all the most exciting diving destinations of the Philippines can be visited including Tubbataha, Visayas and Apo Reef. Opportunity to explore Coron wrecks, reefs, and corals with their amazing inhabitants - thresher sharks, manta rays and whale sharks. 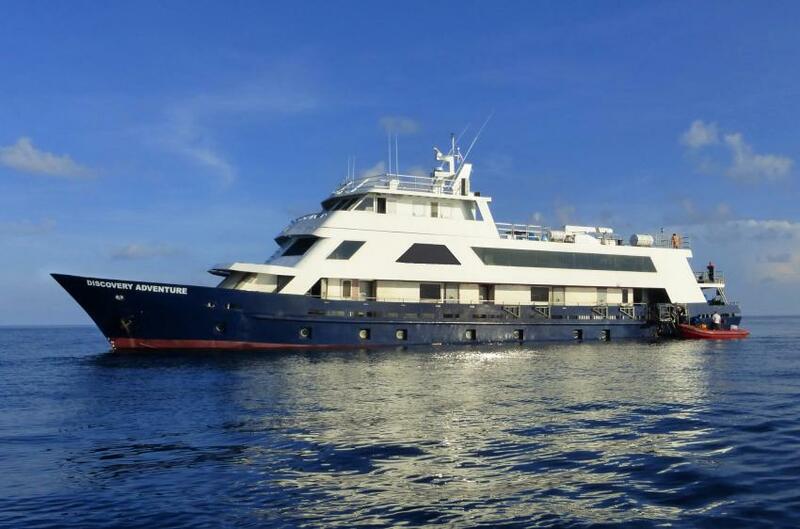 Discovery Adventure Liveaboard has 14 cabins, 8 on the lower and 6 on the upper deck. All rooms have an air conditioning, upper deck staterooms have bigger portholes in addition to watching the view. Boat's salon will be comfortable to relax after diving in the evening and open-air diving area is great to spend time in between dives. Meals are served there. Boat's passengers can enjoy the gorgeous view from the upper deck of Discovery Adventure. Dive deck of Discovery Adventure is spacious. It equipped with necessary stuff to prepare for the dive and to maintain gear after. To get to the dive sites boat crew use 3 chase boats. For divers with EANx certification Nitrox is available on board. Divers can rent all needed equipment on board. For your safety, Discovery Adventure has first aid kit, life vests, and emergency raft, also medical oxygen. Discovery Adventure offers to visit some of the most recognized dive spots of Philippines. Divers will get an opportunity to dive at the famous Tubbataha Reef. It suits for drift dives. Tubbataha feature with a great variety of marine creatures likes lionfish, jacks, barracudas and sea turtles. To spot reef sharks, turtles, and eagle ray divers yacht goes to Delsan wreck. Another dive site that can be visited along the trip is Seafan Alley, that is famous for a great variety of corals. Discovery Adventure trip also includes diving on Jessie Beazley Reef, where different types of sharks can be often met. From November to June is the finest time to dive on the Philippines. Water temperature is warm and visibility is the highest. Although diving here is possible all year round.